Pickards Lodge was originally built as one of the lodge houses to Westonbirt House and it is believed to date back to about 1848. Listed Grade II, this impressive property is built of Cotswold stone under a stone slate roof with decorative barge boards and a small square two-storey tower. The accommodation is arranged over two floors. On the ground floor is the kitchen, the sitting room with bay window and fireplace, the dining room also with its feature fireplace, bathroom and cloakroom. The first floor offers three double bedrooms; the house is offered in need of refurbishment and modernisation. 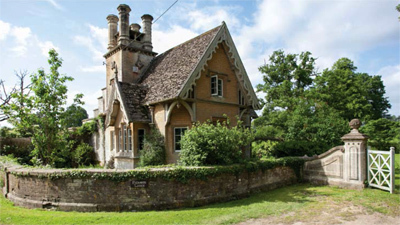 Pickards Lodge is situated on the edge of the sought-after village of Westonbirt. The village itself is small with very attractive period Cotswold stone cottages, and home of the renowned Westonbirt Arboretum. The attractive market towns of Tetbury and Malmesbury are both just four miles from the house, and offer a good range of shops and services. The garden surrounding the house is mainly laid to lawn and interspersed with mature trees and shrubs. The surrounding area is well known for equestrian activities with the Beaufort Polo Club just a mile away. The guide price is £500,000. For further information please contact Knight Frank on 01285 659 771 or visit www.knightfrank.co.uk.